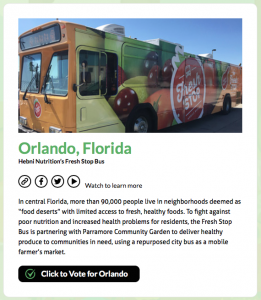 The Fresh Stop Bus » Get your vote in for TEAM FRESH STOP! Get your vote in for TEAM FRESH STOP! Fresh Stop is taking part in an exciting program that could have a big payoff for our mobile market. We need your help to bring home the prize! During the upcoming Tournament of Roses, Miracle-Gro will announce the finalists for its first-ever GRO1000 People’s Choice Community Garden Grant. The Fresh Stop Mobile Farmers Market is in the running for a $40,000 grant to support grassroots gardening in our community. So how do we make sure Orlando takes the lead? It’s a simple clock to vote. Visit miraclegro.com/roseparade and vote for your favorite (hopefully, it’s us). Our own Roniece Weaver and Glen Providence are already in Pasadena with TV’s Ty Pennington and more than 1,000 volunteers to help decorate the Miracle-Gro float and raise awareness for Miracle-Gro’s innovative GRO1000 campaign. The last time we checked, Detroit and Oakland were in the lead. If you have just a few seconds, click the link and keep Orlando in the running. If you have a few more seconds, please forward this to anyone you know who is passionate about community nutrition and wellness. Every bit helps!